The deepest recession in 25 years weakens the government’s capacity to deal with the political crisis and it reduces the public support for the administration. The unemployment rate has reached the highest level in four years – 8.1%. Interest rates and inflation are rising. The GDP shrank 0.2% in the first quarter of 2015, and the IMF forecast a contraction of 1.5% this year. 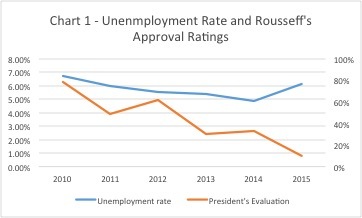 As a result, Mrs. Rousseff’s approval ratings have fallen to 10%, somewhat unexpected for someone who won the election only six months ago (see chart below). The nomination of Mr. Joaquim Levy, a Chicago-trained economist, as minister of finance represents a rupture with the ideas of Mrs. Rousseff’s first mandate, when the economic policy was guided by loose monetary policy and a spendthrift fiscal policy that placed short-term employment and cash transfers as priorities. Mr. Levy is in charge of the economy and has the responsibility to restore macroeconomic stability and credibility in international markets to avoid the downgrade of Brazil’s investment-grade credit ratings. The fiscal measures proposed by Mr. Levy focuses on tax increases, massive cuts in public investment and welfare spending. It is predicted that these measures will save R$ 8 billion (approx. $2.5 billion) on government expenditure and will raise an extra R$ 26 billion in revenues this year. The primary surplus target is 1.2% of GDP by the end of the year and 2% in 2016. (see Austerity Ahead). Aware of the fragile macroeconomic situation, the Brazilian government announced a positive agenda for this brief official visit of President Rousseff to the United States. Mr. Levy accompanied the President even after suffering a slight pulmonary embolism just before the trip. His presence reinforces the efforts of the administration to restore the credibility of the Brazilian government abroad in delivering a tight fiscal policy. “We came here also to say to them that it is important that they realize the great effort in the fiscal adjustment that has been done,” said Mrs. Rousseff on Sunday, June 29th, during a press conference in New York. In her speech at the seminar, the President focused on several opportunities for foreign investment as laid out in the recently announced Investment in Logistics Plan 2015-2018 (Programa de Investimentos em Logística). She said that the objective is to encourage investments in infrastructure, especially in times of fiscal difficulties. “We want foreign investors’ participation, in particular the United States’, whose participation (in infrastructure investments) does not reflect the U.S. share in Brazilian portfolio investments,” she said. According to the government, foreign investments can be the solution to improve investments without an increase in public spending. The president has the arduous task of convincing the world that investing in Brazil is a good idea, that the crisis is temporary, and that the future ahead isn’t as bad as it looks right now. 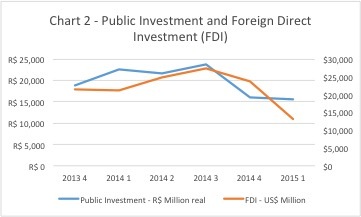 The chart below shows Foreign Direct Investments (FDI) and Public Investment levels since the last quarter of 2013. Both mechanisms are instruments to foster long-term growth. The FDI data shows a significant drop in the first quarter of 2015 compared with previous quarters. Public Investment shows a similar path. In light of these results, the efforts of Mrs. Rousseff to boost investment by the private sector, especially foreign, seems to be right. An increase in the flow of FDI can help to overcome the drop in public investment generated by the tight fiscal policy implemented by the adjustment package. President Rousseff finished the visit with a positive agenda in the relations with Washington, but it is yet unknown whether these actions will be enough to create the flow of investments necessary to overcome all difficulties. The question is whether we can take her words seriously. Some members of the her party, the ruling Workers’ Party, have criticized Mr. Levy for pushing bills that cap labor benefits and compromise the social agenda. However, his nomination is a clear signal that she walked away from her previous economic policies, at least as long as she keeps the minister in charge of the economy. Cassiano Alves is a PhD Candidate at the Graduate School of Economics (EPGE) at Getulio Vargas Foundation in Brazil and is currently visiting the Economics Department at Columbia University. Leticia Correa is an economist and Master of Public Administration Candidate at the School of International and Public Affairs (SIPA) at Columbia University.